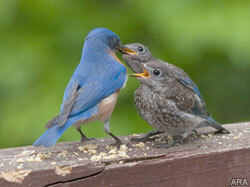 Warm months are crucial for backyard birds. Their long migration north can leave them fatigued, stressed and depleted. Before your feathered friends show up, make sure all bird feeders, baths and houses are in good repair and clean. A quick rinsing with bleach, warm water and detergent gets rid of dirt, grime and mold. Then, think about the menu. This entry was posted on April 21, 2011 at 4:15 am and is filed under Bird Feeders. You can follow any responses to this entry through the RSS 2.0 feed. You can leave a response, or trackback from your own site. very well put..Clean, clean, and clean, then serve nothing but premium food to our wonderful birds.